The five grounding clips for PCB sub-assemblies. The smallest metal parts can often be among the most critical components in larger products, and how they're specified, designed, and manufactured can play a vital role in overall product reliability and cost. While small and seemingly insignificant, for instance, electrical grounding contacts keep sophisticated electronic or electrical equipment (such as electronic message centers) operational by conducting stray electricity safely to ground. For this reason, even the lowly electrical contact requires the proper design and manufacturing considerations when designing the larger system. When it comes to electrical contacts, variability in requirements from part dimensions and materials to contact area, location, and spring quality can make ordering from a parts catalog difficult. Complicating matters, the design engineer doesn't necessarily know what features are going to be a manufacturing problem or will add significant expense. This is when working with the right manufacturing partner and using the best manufacturing technology for the job can have big payoffs in design reliability and cost. 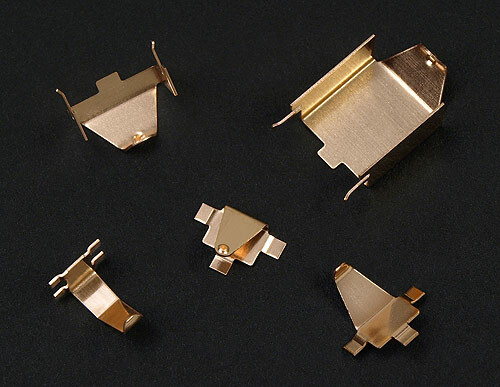 When Brent Brown, an engineering consultant for Salt Lake City-based YESCO (www.yesco.com), set out to design a group of grounding clips for printed circuit board (PCB) subassemblies, he knew that custom-designed and manufactured parts would be required. "At first, you look for an off-the-shelf part that's manufactured in higher quantities, but unless it's a very common application, you typically end up having to design it yourself," says Brown. "An off-the-shelf part seldom works as well as if you designed it for the purpose, and in this case, it had to be custom." Some of YESCO's largest displays have over 10,000 PCB sub-assemblies in them controlling computer-sequenced LED lights. For instance, YESCO's Wynn Las Vegas sign is 135 feet tall with a double-faced 100-by-50- foot LED message center and a first-of-its-kind "moving eraser" that glides silently up and down over the EMC, appearing to change the graphics as it goes. "Since the displays are typically in service for ten to fifteen years outdoors, quality, corrosion, cost per part, spring tension, and spring-back were among the issues considered for these contacts," explains Brown. After Brown defined the first part – a surface-mounted grounding contact to be soldered onto PCBs on tiny pads – he next talked to a variety of companies and emailed them concept drawings to find out who had the expertise to help with its design and manufacture. "We had a number of companies quote the part and tooling – including those using hard, dedicated tooling such as power press progressive dies. But the tooling and parts were too expensive." 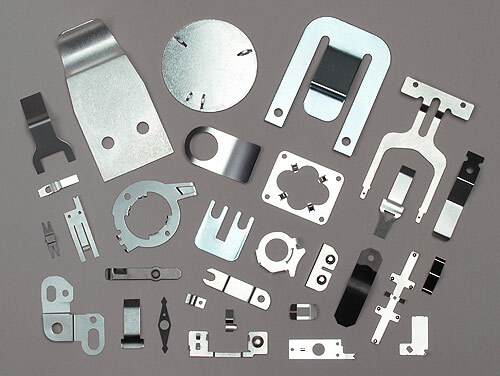 Fourslide manufactures a variety of parts in stainless steel and other materials. Brown, however, soon found a willing partner in the design and manufacturing process when he contacted Jim Richards, director of Sales and Marketing at Fourslide Spring and Stamping, Inc., a Bristol, Connecticut-based parts supplier specializing in the integrated stamping and forming parts operation called fourslide. The fourslide part-making process' unique integration of stamping and forming operations cuts typical tooling costs to as little as $3,000, halves tooling lead times, and eliminates after-production adjustment to meet specifications. The process begins with the raw material in flat strip form off a coil, which is stamped or blanked in the progressive die section of the fourslide machine. This section is a fully functional but lighter version of the progressive die found in most power presses. Where high-speed power presses can cost hundreds of thousands of dollars, fourslide machinery typically costs just a fraction of that, which enables greatly reduced shop rates. Fourslide production at up to 15,000 pieces per hour can be achieved depending on part size and complexity. And since the process typically starts with material the width of the finished part, it usually generates less scrap than power press machinery, so material costs are often lower as well. Each time Brown emailed Richards a concept drawing or sketch of the part he wanted, Richards replied back suggestions and minor tweaks to help with part manufacturability and cost. To provide a good combination of spring properties and electrical conductivity for the grounding clip at reasonable cost, for example, Richards suggested using phosphor bronze as a material. "Many design engineers request expensive options such as beryllium copper because it has good spring properties and electrical conductivity," says Richards. "That's true, but it's up to four times more expensive than some alternative materials with good spring properties and electrical conductivity such as phosphor bronze. "Beryllium copper is a very expensive base material that typically requires a heat treating process to add its spring properties?a rather expensive process since it must be heat-treated in a controlled atmosphere." Through testing, Brown determined that half-hard phosphor bronze was sufficient for the application. "The material also provided corrosion resistance, which helps with our outdoor weather requirements," he says. Satisfied with the first product, Brown designed two additional types of surfacemounted grounding contacts, plus two types of pin-mounted grounding contacts whose pins go through holes in PCBs perpendicular to its pads. "Depending on which configuration of grounding contact it is, the tab that sticks up from the circuit board is the spring and conductor at the same time," says Brown. From order to shipment, it took about eight weeks to complete all five types of parts. Many progressive dies can take twelve weeks or longer since power press progressive die work requires more complex tooling changes and is typically done overseas with substantially longer lead times. In testing, Brown mounted the prototype grounding contacts on circuit boards and put them into the subassemblies. He checked for compression to see whether the parts yielded or not, whether they were hard enough to maintain contact strength, and if they met additional requirements. "The prototypes and products worked the first time, and we haven't had any trouble with them," says Brown. "Because the grounding clips resist corrosion and don't lose spring, they should be good for many years. If we do another sub-assembly that requires a different grounding contact, it would be relatively easy and inexpensive because the fourslide process is so versatile in building different parts with minor tooling changes."